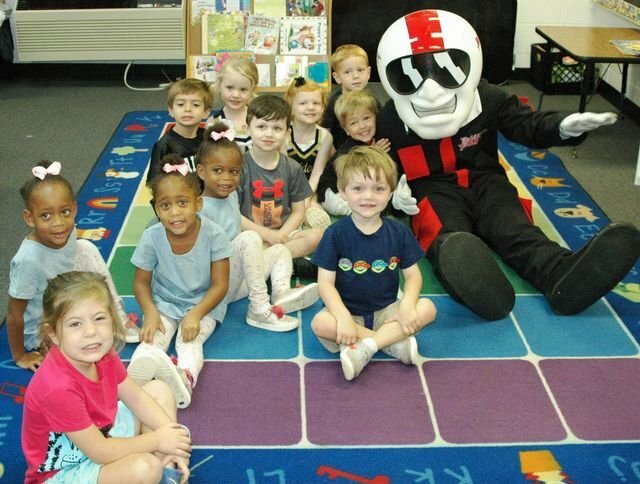 Pictured: Southland Academy K3 students love South Georgia Technical College Mascot, ACE! What a treat! The Southland Academy Lower School students had an exciting morning as student athletes from South Georgia Technical College visited the Southland campus. Answering questions, giving high fives, and taking pictures, the basketball players were fun, energetic, and very kind to the young Raiders. The lower school students were intrigued by the student athletes' heights, accents, and engaging personalities. They especially enjoyed the basketball players taking the time to read to them. ACE also took time from his busy schedule to join the fun and visit the Southland students. Coach Chris Baullauer, SGTC Assistant Men's Basketball Coach, Kenzie Conyers, SGTC Assistant Women's Basketball Coach, and Terri Battle, SGTC Athletics Assistant were also on campus. Southland Academy is very appreciative of South Georgia Technical College and its desire for community connection and wishes the Jets a great basketball season.